Keep in mind that according to the description in Egil's saga, the blade on the "Mail Piercer" was two ells long, which equates to about 3 feet. Put a three foot blade on a four foot haft and you have up to a seven foot weapon, depending upon the amount of overlap. It would also depend upon where the spike was positioned, assuming Thorolf's opponent would slide down to the spike, but it could still be quite possible to hold a fellow aloft and have the effect be quite dramatic. I think it would be well-nigh impossible to hold a man aloft from a standard spear, as the shaft wouldn't survive the lateral stress of hoisting the weight upward. Someone who understands physics better than I could probably calculate the strength necessary to hoist up a 180+ pound man on the end of a seven foot spear versus a five foot "Mail Piercer" (assuming the spike appears two feet down the blade), which reportedly had a very stout shaft. Elling, as soon as I get to Toni's I'll start searching for the saga that has that passage. I moved all of my sagas, as well as many other books, to Toni's when my daughter and grandkids moved i with me. I should have remembered it, but didn't. As soon as I find it will post it. As for length, George Silver (Yeah, he's quite far removed from the Vikings) mentions 7-8 feet as being the ideal height for a browwn bill. My own experince i playing with this stuff, and sparring with frineds, confims this as far as I'm concerned. Once I get past 8 feet, the weapon is too hard to contral, and makes it easier for someone to get inside your guard. As I see it, the description in Egil is just to vague to be clear. if "colloquial" language was used it would not make much sense of to us. Consider describing a new semi-automatic handgun to me, with both of us being familiar with .45 ACP's and then using the same terminology to someone who had never seen a handgun. He wouldn't have any idea of what you were talking about. I am far from sure that the halberd in MRL is correct, I just think it is a reasonable guess. David from my reading an ell can be anything from 22 to 45 inches.Oakeshott Type X blades average what, 31 inches? A 44 inch blade would be a bit of a smithing feat for the period, methinks. The kind of thing a kind would want to have buried with him. While the haft of the weapon is described as being thick, the effective stress involved should be somewhat similar to a polevault performed by an armed and armored man. That's more than a bit of stress on an ash pole. The trouble with the passage is that the author is probably going for dramatic effect, and we're trying to extrapolate factual data from dramatic flair. Honestly the whole passage sounds hoakey, but the idea is just so cool, it's fun to imagine. I'm sure Snorri had a twinkle in his eye when he penned the words. 300 years of slight exaggeration will do that to you. But if the pole is only, say 1m long, and as thick as a axe pole, it wouldn't be a great problem. Are you implying that the information in the sagas isn't 100% factual? For shame! One point of contention though: Pole vaulting is very different from lifting a dead weight on the end of a pole, regardless of how long the pole is. If this event happened at all, I think that Elling has the right of it: Thorolf may have set the haft into the ground and used the corpse's forward momentum to hoist it upward. Once the body was on the ground, it would take at least two strong men, and probably three, to accomplish this feat. I've seen fresh corpses and found them to be most uncooperative. I agree that Snorri probably took a bit of poetic license with this. Perhaps Thorolf held up the man's helmet, or perhaps his head. Taking the passage literally, one is left wondering why, in the midst of a ferocious battle, would Thorolf want to encumber his main weapon with an impaled body. His shield was on his back and it must have taken both hands to hold the body aloft, which would have left him a sitting duck. I think of the sagas as the comic books of the day. In another century, our progeny will be debating if Batman's cape really could function like a parachute. Although somewhat off of the subject, David brings up to points to comment about, with his reference of the battle and to Batman's cape, both which I have covered in the book I'm writing. Battle-When I was young I was pretty wild, and was involved in a few gang fights. I've also seen some interesting footage of the same thing in today's world. Curiously, they were very similiar. I also think that many of the melee's in the Sagaa were much the same, with some guys fighting and other guys standing around , then getting invovled, maybe trying to hit someone when they weren't looking, fighting for a bit,then backing and a taking a breather. We do not think of battles like this. Instead we picture them as masses of men hacking and chopping in line. I think the reality was somewhat different, and you could have areas where in was more melee like. This could explain Thorolf's actions, but the truth is this is all speculation.. But then thats what these discussions are about. The Batman's Cape comment is the other. ( I've always used Sgt. Rock Comic books instead of Baqtman. That in the future some body will uncover one and think that you could hit someone in the stomach, bend them double and send them flying for 5 or six feet.) You cannot trust the drawings and paintings to give actual examples of fighting. Consider the Macijowski Bible, that shows steel helmets being split with a one handed sword. Not possible. Some of the fighting text showing a guy gripping the blade of his sword with his bare hand and striking wiht the pommel, and the next illo showing the same sword bing use to cut someone in half or lopping off limbs. While you can grab a sharp blade momentarily, any real movement, such as twisiting and pulling will inflict a bad cut. In short, we have to take all of this with a grain of salt, but also remember that the Sagas do not go into a lot of exaggeration like of lot of Medieval manuscripts...not staking up 17 Saracens on one lance..
Nicola could you give us some information on these pics? They are very nice, but we need more to go on. Hank, I know exactly what you're talking about, in highschool I was definitely drawn into the culture of angry young men. There are varying levels of involvement in ongoing feuds, brawls, and rumbles. Some guys are just opportunistic, or cowardly, and will take cheap shots. Some just watch unless they get sucked in. That all makes sense in some blood fued sagas (i.e. Laxdaela) where it's essentially gang warfare, but I don't think that's so much the case in larger battles, especially considering the lack of "prisoner's rights". That's not to say battles don't have ebb and flow, or that sections of the line might be disengaged and resting, but the stakes are higher, so it's hard to imagine people smoking and joking while their left flank is run down and butchered by cavalry. I would imagine more a state of alert rest. Anyhow, in the fights of my youth, if there was an expectation of lethality, you didn't see that kind of casual involvement. Everyone was on edge, alert and ready to fight or beat feet as soon as things went bad. It's a very different dynamic. We do quite a bit of "skirmish" training; fighting in groups and so on. We spend quite a bit of time teaching people to act quickly and correctly when the lines break down and everything turns into chaos; moving, teaming up, avoiding being outnumbered. The ones that master this skill are very, very efficient. I have seen, and octagonally done myself, experienced fighters that whack their way through three or four "lesser" foes. "it is imposible to beat ten men at once. But quite posible to beat ten men in a row." An exception that is far removed is the yariganna. The ancient Japanese spear plane. It has a passing resemblance to the yari, but would not make the best substitute, nor used for hewing pre se, but it does clean up just after. I can imagine a long bladed spear like object being used to shave level green timbers after the axe or adz, with a 3 foot handle you could use your whole viking body. Obviously speculation, but it could have been more spear-like than the yariganna, so more useful as a weapon yet never became as popular or necessary as axes but not out of place in a shipyard of duplicitous minded fellows. Even with this woodwork connection you still end up with the same thing. A long bladed spear, but surely not(?) sword length. So I tried to stretch my brain out, spread the definition of hewing to processing the cut log to beams and squeeze in David Martin’s description where he mentioned plowshare into something that might have been. If you had the thick roundish point, sharpened to a diamond just at the end,(or maybe it’s just a dull round point) tapering back to a wing-feather shaped blade, a back spike if need be, socket and 3 or 4 foot handle, it might be good for prying, chopping bark off logs. It might have a 3 foot blade, 2 might be better but still sounds long. You just have to polish and sharpen it up for fighting day. I tried looking for something that might foot the bill, the only thing I got was reminded that GBruks makes an 11th c T shaped broad axe. Or is it an just an axe head mounted on a spear, that sounds like something you might take to a gang fight. It’s been fun to think about but I don’t think I got anywhere. Greetings Kevin Toomey, Thank you for bringing the "metaphorical" angle up. I have harbored the same suspicions. A misinterpreted kenning gone wild? A description of performance rather than item and purpose? The same may go for the halberd. Stories told to liven up a dark winter night and keep the teller in food ,drink and admiration rather than an analytical description of a weapon as we might seek these days? Dramatic liscense has been around for a long time. Sorry Patrick, I'm having trouble figuring out exactly what you mean. Greetings Kevin Toomey, Okay like you said. Maybe a spear that takes down a lot of men. A weapon of merit, good at what it does. Thorgrim felled Olaf's men as trees in the forest with his mighty spear versus Thorgrim created alot of casulites with his slicing techinque of his "specially" designed cutting spear. The kennings, from what I have learned so far, are phrases that make the audience think for a moment. It gets you more involved in the story. Audience particpation. Same thing with the halberd. Bards and Skalds in the days of old were the "medium". They were compensated for their services. So here we are on a cold, long winter night bored to death. I am telling the story. I could say " Thorgrim whacked Olaf with his axe and he died". Or I could say " Thorgrim hewed Olaf to the breast with his mighty halbred of two ells length to the breast and hoisted him high for all to see his death." Which is a better story line? We in our day might be looking for something like " Thorgrim hit Olaf with his type L axe with an 8" cutting edge to the solar plexus which resulted in death due to blunt trauma." I was wondering if I am wrong in my assumption that the term “hewing spear” is always taken to mean a cutting sword like spear or do you, others ever use the term to mean hewing as with hewing axes. I’d like to say that my interpretation of the times leads me to believe it was very much an “Ay’s the b’y that builds the boat and A’ys the b’y that sails her” world. I think there must have been an esteem and appreciation of a good tool. Power over wood was power of their world; they were important things at least, and if you could poke a monk with it, so much the better. A tool of risk! I don’t think you’ll find any shortage of those who argue or a least caution that the sagas are a lot of story telling. I was grasping at straws trying to find a way to pull it away from purely descriptive language to literal meaning. or at least a descriptive literal. Looking at it some more I put the GransforsBruks 11th c broad axe on my “to buy sometime later” list. I found it for 375usd, that’s not too awful bad. If you turned it around, mounted point first, on a longer haft, eh? You could possibly claim that it has been converted from axe to spear. But so you don’t confuse it with a literal and specialized weapon only spear, I’ll call it a hewing spear. I haven't had the time to devote to this like I would like, as I have had some other things develop that I have to attend to. But I have been doing some research. I haven't yet found the reference to the axe shaped like halberd. But I have a large number of Sagas and books containing sagas, so will continue to look. But in the reaseach I found some other interesting things. 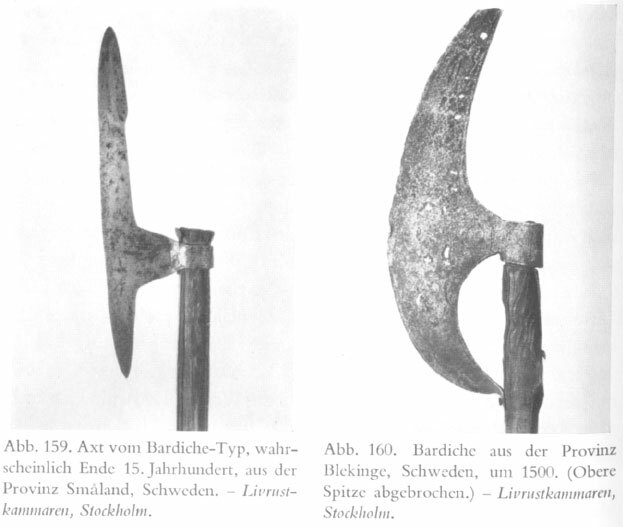 Falk, in his book, Altnordische Waffenkunde, describes the halberd as something like a two edged sword mounted on a shaft. There were two types, a long shafted one for thrusting and a short shafted one for cutting and thrusting. I am currently trying to locate a copy of the book, which was published in 1914. He also translate the word hoggspyjot as hewing spear. In the Saga of the Faroe Islanders, in the book Thrand of Gotu, Sigmund is described as having an axe, inlaid with silver, with a wide hooked blade and the shaft bound with iron. He climbs a wall by hooking his axe over the top and pulls himself up. "A man comes straight at him and strikes at him with a sword. Sigmund parries the blow with his axe and quickly thrusts the point of the axe deep into him so that the axe sinks deep into his chest and this one is soon dead. Ossur is quick to see this and runs at Sigmund and strikes at him. Sigmund again parries the blow with his axe and strikes at him and takes off his right arm, and down falls his sword. Sigmund thrusts a second time at Ossur and the axe goes into the hollow and Ossur falls." Later Sigmund uses this same axe and "puts the top point of his axe against Thrand's chest and says that he will feel the full weight if he doesn't pay him the money.". Now the only Viking axe that I have seen that can do this is the T shaped axe. I think that it is wrong to relegate this axe merely to woodworking. Any axe can be used as a weapon. 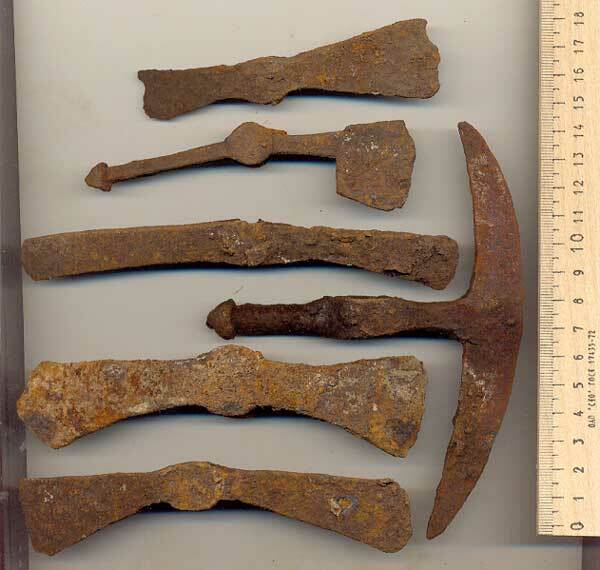 One of the most common Viking axes, that with the deeply hollowed back, was, and is, primarily a carving axe. The hand grips the blade close the the head and is used for rough shaping. 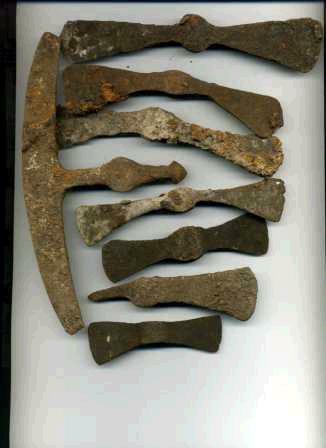 Also the T shaped axe shows up in a lot of places as a weapon, and is quite popular in India and Africa. About the only axe that is not also useful for other things is the great huge "Danish" axe with the blades 10-12 inches in width. This blade is so thin that it is not suitable for woodworking, but great for lopping off limbs. Hank, I think everything described in that last passage could be accomplished with a normal Danish broad axe. It reminds me of instances in Njall's Saga where Skarp-Hedin's axe Battle Troll cuts into someone's shield yet kills them with the "upper horn". I take these horns to refer simply to the pointy ends of a normal crescentic axe. This is certainly something that we have to consider, but I tend to think it simplifies things a bit too much. I could see the "horn" of a Danish axe stabbing someone, but I don't know that it would be effective enough a method for me to then go intimidating people with it. Also, it may not be a weapon of the same variety, but one of the saga's (I believe it is Egil's, but I don't remember) mentions a man stabbing someone with his "halberd" between the shoulder blades so that the point came out of the other side of the man's body. This description may be poetic license, but it is use more than once in that saga and I think it it might have been used in others as well (I don't really remember, and my references for these statements are currently in the mail). I don't think that a Danish axe is going to penetrate far enough to come out of the other side of a person's chest. The types of hewing spear mentioned by Falk is Kesje and Atgeir. I addition he mentions the Bryntvari, or mail piercer, from Egil's saga. Atgeir is usually translated Bill or helbard by the english translators, as is Kesje. Of course, these translators are not exactly experts on weapons and armaments. Bryntroll is more uncertain; noone knows what it is; Falk sugests a double bladed axe, but more likely is a weapon with some kind of armour piercing spike: Bryntroll means Maile troll, indicating that it was a "anti armour" weapon. A posibility is a danaxe style weapon with a backspike. I haven't looked much into these, as of yet. I of course now on a mission to figure out where I saw it. After much looking at books when I should be working I figure its gone and I won't find it anywhere. Then yesterday I flip open Blankwaffen as I am talking on the phone and there it is staring me in the face. Can't believe I did not think of it right away when the discussion started. Very similar with a straighter blade, though no back spike but I think one has to admit when looking at these examples that there would have been a decent range of variation in these and we now have 3 good examples.